While it’s not a exhaustive examination of every recording of Dowland’s solo lute music in history, I believe all the major recordings are here, and a lot of others as well. If I’ve missed anything important I trust that members of the lute community will let me know! Only recordings on compact disc are considered here. I began collecting lute recordings in the early 1990s, and while I have many CDs that are remasters originally released on LP, by the time I began to study the lute I had mostly abandoned my vinyl collection. I haven’t had a working record player in nearly 30 years. Despite the triumph of streaming music services, digital download, the resurgence of vinyl, and the predicted demise of the compact disc, as of this writing it’s still my format of choice for lute recordings. For a robust discography of lute recordings on CD, click here. I am not a critic. Although I write about music from many different perspectives and occasionally stray into territory covered by critics (like CD reviews), I generally avoid writing from that perspective. This essay is meant to describe the recordings that have been made and are available, to the best of my knowledge, in hope that such a survey may be of use to others interested in Dowland’s music, as well as a way of helping me to order my own impressions about them. Dowland left behind more music for solo lute than any of his contemporaries – but unlike his songs, most of which were published during his lifetime, little of it was published until the 20th century. Most of Dowland’s solo lute tablatures are found in English manuscripts, some in manuscripts scattered across continental Europe, and many of his pieces exist in more than one version. To my knowledge, no complete catalog of his known works has yet been assembled, although a tremendous step towards this was done by Diana Poulton and Basil Lam, who gathered his solo lute music into The Collected Lute Music of John Dowland, a scholarly performing edition published in 1974. “P” numbers attached to untitled or generically titled pieces on these recordings refer to this edition. Lindberg, Jakob, 1994/1995. John Dowland: The Complete Solo Lute Music. BIS-CD-722/724. 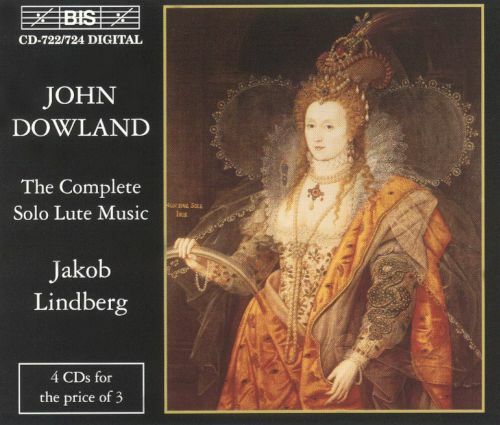 Jakob Lindberg‘s John Dowland: The Complete Solo Lute Music was the first such collection to be released – it came out in 1995. This was in the middle of the decade of my life when my absorption in the lute repertoire was at its height. I bought this set as soon as it appeared at the NYC Tower Records store I haunted, waiting for treasures like this to show up. The Swedish label BIS Records released all four discs in one package – Lindberg’s collection is distinct in this; O’Dette’s and North’s collections were originally issued one disc at a time, and only repackaged as box sets after all discs had their individual releases. A single disc of selections from the complete set was subsequently released by BIS as John Dowland: Selected Lute Music in 1996. I decided to group the pieces according to the sources that my chosen versions come from. To group them chronologically is a mistake since, as Diana Pouton puts it in her book on Dowland, ‘the making of an accurate chronological list is an impossibility’. It would also restrict one to choosing the earliest version of each piece. This is not desirable since later versions are often more reliable. Undoubtably subjectivity plays a part when one decides which one of many versions is the ‘best’ and I sometimes differ from my dear teacher Diana Poulton in this respect. My correction of ‘mistakes’ and my reconstructions of unclear or missing bars are also personal, as are the varied repeats I have added when these are missing in the originals. I own a number of BIS recordings from this time and the impression I have is that they were made with an audiophile in mind, i.e. with primarily an aesthetic dedicated to recreating a sound image as close as possible to that experienced by a listener in the presence of the original audio source, in the room where it was recorded. Perhaps with a hi-fidelity system including excellent speakers situated the correct distance apart and from the listener, these CDs sound the way they were meant to but alas! although I am an avid CD collector, I am a musician, not a true audiophile. Due to the demands of work and family life, my time available to listen to recordings is often while I’m in the car or the kitchen. As gauche as it may be, I generally prefer to listen to lute recordings that come closer to recreating the brilliant, warm, and intimate sound I experience when I am playing the lute myself, and I have not listened to these fine recordings as much as others in my collection. O’Dette, Paul, 1995. John Dowland: Complete Lute Works, Vol. 1. Harmonia Mundi HMU 907160. Paul O’Dette (b 1954) began recording his John Dowland: Complete Lute Works for the French label Harmonia Mundi around the same time that Lindberg was recording his collection, and it was difficult at the time to escape the impression that there was rivalry between the two eminent musicians around the timing and execution of these projects. O’Dette took a thorough and expansive approach when constructing the programs for his complete Dowland edition. Lindberg’s statement that “to group them chronologically is a mistake” notwithstanding, to some extent this is what O’Dette did, especially with volumes 2 (earlier works) and 4 (later works). O’Dette’s sensibility as a performer is very much in evidence in the selections he chose for all five CD programs: each includes a well-sequenced variety of examples of the full palette of forms Dowland composed in: pavans, galliards, almains, fantasies, toys, and variations on English ballad tunes. The instruments and whether he chose to string their courses in octaves or in unison also reflect O’Dette’s attention to changing practices in lute performance over the course of Dowland’s lifetime, and his methodical illustration of these nuances through these performances. Lute builders made increasingly larger instruments with added bass courses during the second half of the 16th century and into the 17th, and O’Dette’s choices reflect these developments. Instruments used for the project include 8-course instruments by Paul Thompson (1, 2, 3), Malcolm Prior (1), and Klaus Jacobsen (4, 5); a 6-course by Paul Thompson (2); a 10-course by Ray Nurse (4, 5); and an orpharion by Stephen Barber (1). O’Dette’s Complete Dowland features a significantly larger number of tracks (111) than either Lindberg’s (92) or North’s (86). One reason for this is that rather than record only one “best” version of a number of Dowland’s pieces that exist in more than one version, O’Dette recorded both early and late versions of a number of these over the course of the project. Dowland was a restless reviser, constantly updating and rearranging earlier works with increasingly fanciful ornamentation and richer harmonies. Most of his earlier pieces exist in later and more elaborate versions. Another reason that accounts for this disparity in “completeness” across the three collections is that Volume 5 features works that technically may not be part of the Dowland “canon”. Volume 5 is in fact a veritable Dowland “apocrypha”. It is possible that none of the pieces on this CD were conceived by Dowland as lute solos in their present form. Some of them are arrangements of Dowland’s music by other lutenists…, some were written by other composers in the style of Dowland…, while others are consort lute parts performed as solos… I have also included the three surviving pieces by John’s son Robert. Several of the works heard here are attributed to Dowland in the sources, but are unlikely to have been written by him. Each volume of O’Dette’s Dowland’s Complete Lute Works received the prestigious French Diapason d’Or, and the 5-CD boxed set received the Diapason d’Or Of The Year Award (1995, 1997). North, Nigel, 2004. 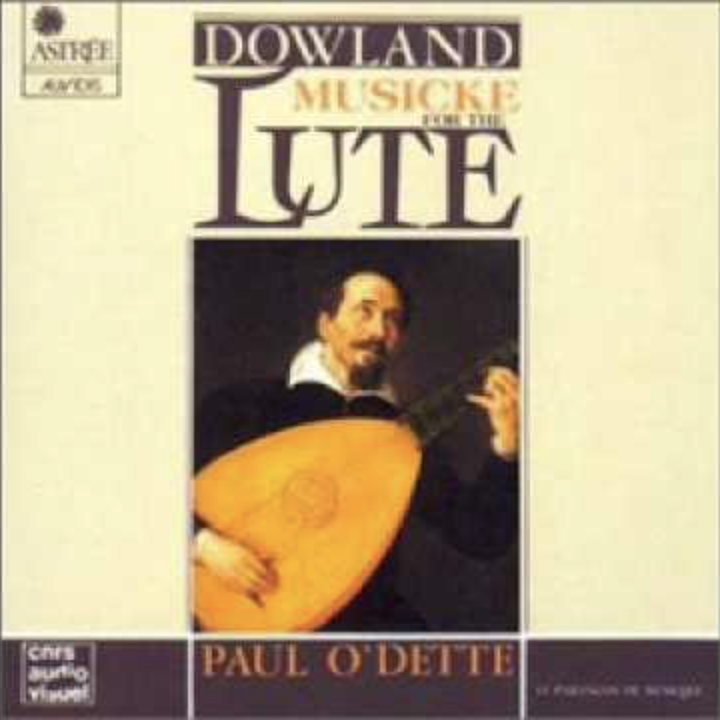 John Dowland: Complete Lute Music – 1. Naxos 8.557586. 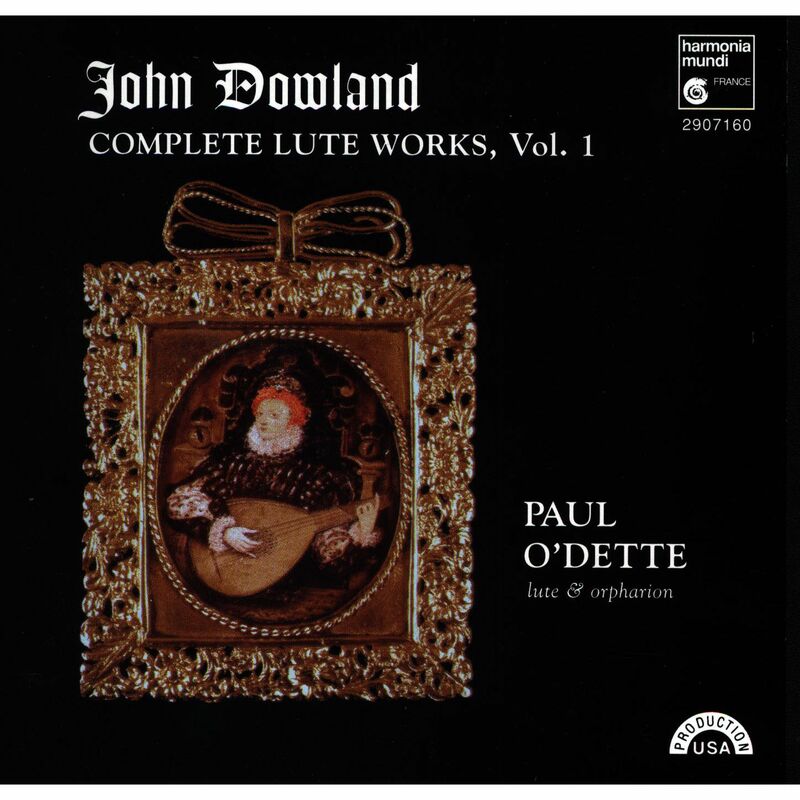 Recorded for Naxos a decade after O’Dette’s collection, Nigel North‘s John Dowland: Complete Lute Music is the first (and only) complete Dowland edition released by an English lutenist. Like Paul O’Dette, Nigel North was born in 1954. 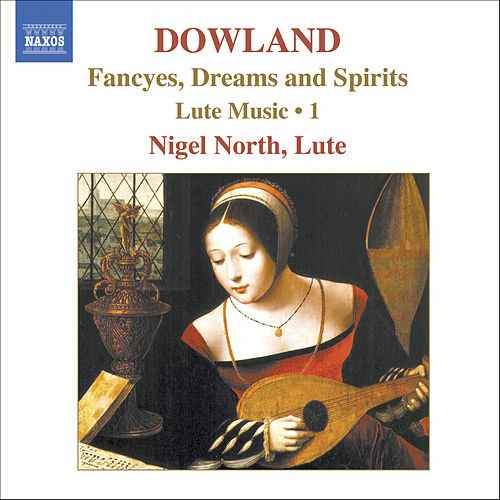 Fancyes, Dreams and Spirits features Dowland at his most free and inventive, and includes the fantasies alongside his various toys and idiosyncratic pieces. Dowland’s Tears features a selection of pieces including seven pavan and galliard pairs that revolves around Lachrimae and illustrates Dowland at his most melancholy. Pavans, Galliards and Almains is an ingenious progression of 21 pieces, seven triptychs each consisting of a pavan, a galliard, and an almain. The Queen’s Galliard concludes North’s edition with Dowland’s remaining galliards (he wrote more than 30 altogether) and his variations on English ballad tunes. On these recordings North plays an 8-course lute by Paul Thompson (1, 4), 9-course lutes by Paul Thompson (1) and Lars Jönsson (3, 4), and a 10-course lute by Ray Nurse (2). He employs a broad range of pitch standards including A = 392, 400, 415, and 440! In developing his programs for these discs, North explores the 16th century tradition of pairing pavans and galliards to a greater extent than Lindberg and O’Dette did on their recordings. In 1597 Dowland’s contemporary Thomas Morley wrote that pavans and galliards were often paired together and the galliard was ” a kind of music made out of the other”. Unlike some contemporaries such as Anthony Holborne and Francis Cutting, Dowland left us very few pavan and galliard pairs. The only true pair is the Lachrimae Pavan and Galliard to Lachrimae, although probably not written at the same time. In 1604 Dowland published his now famous collection Lachrimae or Seaven Teares… the collection begins with Seaven Passionate Pavans, all based on Lachrimae, which are then followed by “divers other Pavans, Galliards, and Almands”. It is both wonderful to have this set of music by Dowland, prepared by him and printed for all to play, and yet also strange that he never made a similar collection for solo lute. So here I have tried to imagine what Dowland might have chosen for a solo lute collection. In his liner notes, North describes the program for CD 3 as similarly inspired by both Dowland’s 1604 collection and Holborne’s Pavans, Galliards, and Almains (1599). North also contributes his own lute solo versions of a few of Dowland’s notable songs including I saw my lady weep; Come again, sweet love; and Awake, sweet love. All three of these editions collect together fine performances and each provides the listener with a different window on how Dowland’s music might have been heard and understood by his contemporaries. Both Lindberg and O’Dette chose to play a few pieces in their editions on orpharion – a nod to Dowland’s pieces included in William Barley’s A new Booke of Tabliture for the Orpharion (1596?). The wire-strung instrument was tuned identically to the lute and their repertoires were regarded as interchangeable. While O’Dette’s performances may demonstrate a slightly more consistent approach to performance across his entire collection than the others, all three were clearly developed with thoughtful attention and a sense that these recordings are scholarly exhibits, not mere commodities. Lindberg and O’Dette were in their early forties when they recorded their editions; North was in his early fifties. A difference may be discerned here in some of North’s choices of tempo, approach to phrasing, and other interpretive considerations, which reveal at times a more mature and relaxed performance sensibility: North had about a decade’s more experience as a lutenist than either Lindberg or O’Dette when he recorded his collection. By walterbitner in Early Music, Music, The Lute on September 2, 2018 .